Last year, heartthrob Ryan Gosling and Danish director Nicolas Winding Refn proved an incredible filmmaking team with the sleek and stunning thriller Drive. So few were surprised when Gosling agreed to reteam for Refn's next effort, the Bangkok-set cop drama Only God Forgives. 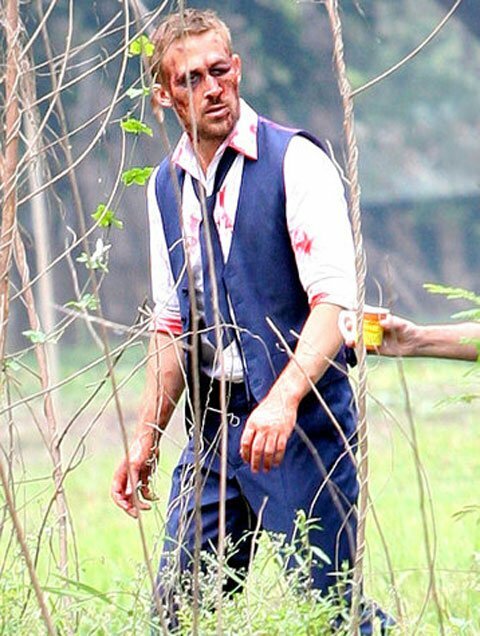 In this feature, which is now shooting on location in Thailand, Gosling stars as a crime boss's son who is looking to expand the breadth of their business to the Thai market. However, while exploring the possibilities abroad, he and his brother get involved in a murder investigation and thereby become entangled with a local police lieutenant known as the Angel of Vengeance. Their confrontation ultimately comes to a head in a treacherous Thai boxing arena. And from the looks of the image below, Gosling may well take a beating there. In this photograph from US Weekly,Gosling is shown in the remnants of a vibrant blue suit, covered in blood with his face covered in gruesome makeup. Looking severly pummeled, Gosling barely resembles the handsome leading man adored by the whole of North American women. Unfortunately, this shot seems to reveal about Only God Forgives is that Gosling's gangster has a flair for fashion and gets badly battered in during the course of the film. Which really, those who've seen Drive could have assumed. Only God Forgives is slated to open in the Netherlands on March 28th, 2013. No date has yet been announced for the film's Stateside debut, but distributions deals for North America are in the works, so a release announcement should be made soon.